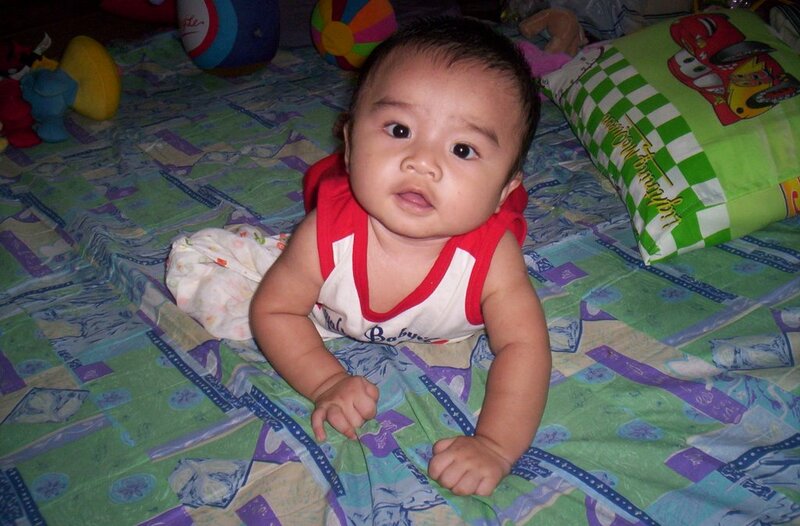 Baby Daniel started his tantrums right after we started our journey. About a few km lagi nak sampai, he cried for susu, and while drinking in big gulps, he suddenly threw up on Mummy! Macam fountain, I tell you! I was soaking from in front to the back of my dress (baju baru pulak tu!) Tak boleh Mummy nak bergaya sikit! 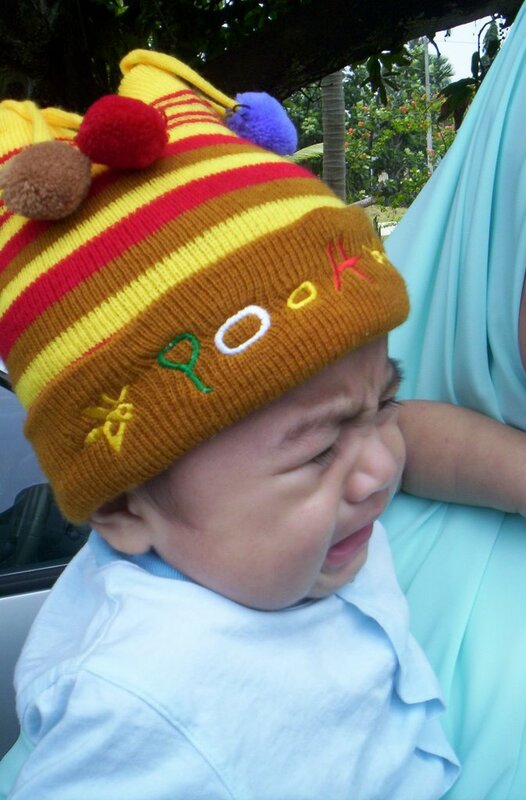 Lepas tu he continued crying...Mungkin tak sedap badan or mungkin the weather was just too hot.. I went to office Monday morning, received a tergezut news from my client that his request to buy stuffs had already been tendered-in and going to be closed in two days time! Aiyoh! And I needed all the relevant certificates to go and collect the tender documents, which were not available in my office.. Called my boss, and since it was an emergency, he decided to FLY DOWN purposely from Penang to send me the documents. He said we would make the arrangement for the flight and would call me back shortly after that. When he finally called, he said he had already booked the ticket and ready to board the plane shortly. He had to book a business class seat as the economy class seats were fully booked. Costed him around RM700! When I asked him to check the certificate for the relevant kod bidang required to participate in this tender, he said the kod bidang that I requested was not available inside the certificate! I started to panic, he started to get angry, but luckily he could cancel the ticket and get the refund.. Kalau tidak, habislah I kena maki..Turned out that they never renew the license for that particular kod bidang...Hampeh sungguh! Nak tak nak, I found other ways to do it, and went to get the certificate from another company in Bangi and shot straight to Melaka to buy the tender forms. Started the journey back at around 4pm and on the way, Mak called to say that they have decided to send all my 3 Neneks back home to JB and Melaka that day, and asked me whether I wanted to follow. Since I needed to pass back the company's certificate, I asked Abah to pick me up at Bangi instead. Left my car there, hopped into Abah's car, and we started the journey south (again?). Sampai kat Pedas, we had to stop because the front right tyre was punctured. It was about 7pm and beginning to get dark already. I requested for help from PLUS, using their emergency phone (first time ni guna...ada sikit jakun gak..hehe). Masa tengah tunggu tu, ada pulak 2 Indian men ni nak tolong (konon) I warned Abah already about these highway culprits, but Abah allowed them to 'help' jugak since he was afraid that the PLUS guys would never come. Daniel pulak dah start menangis (actually melalak) because we were right next to a jungle, it was dark (God knows what he did actually see) and the passing-by lorries made noise so loud, they scared him. 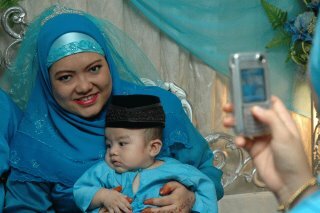 Kecian bucuk Mummy. It was about 10 minutes, and using the spare tyre (which was never used before) we managed to continue our journey already...Damn those highway culprits!!! Sampai Melaka, Abah was too tired to continue with the journey to JB, so we slept at Nenek Melaka's house that night. Started the journey to JB at about 8am, reached Nenek Johor's house at about 11am. Had early lunch, and we shot back. I was supposed to complete the tender forms that day, and we were awfully delayed. Pasrah jelah. Mak, Daniel and I slept through half of the journey. It was blazingly hot on the highway, the air-cond suddenly chose not to function, I was just awaken from my nap, and Abah was trying to overtake a lorry at 120km/h, then suddenly, there was blast! The spare tyre meletup, the car was maneuvering to the right, Abah was desperately controlling the steering, and the rest of us were just too terrified to speak! Alhamdulillah, Abah managed to control the situation, and once again, we tersadai kat tepi highway. It was about 1pm, tayar dah bersepai, satu lagi punctured. I was trying to gauge where we were to call the emergency line (again! ), but Alhamdulillah, rezeki Daniel agaknya, the PLUS patrol car stopped right behind our car when we managed to stop. Rupanya they saw us in the emergency, and said it was lucky that Abah didn't press the brake hard. If not, we could have toppled over, like what happened to a CRV they had helped earlier with the same case. Alhamdulillah, alhamdulillah!!! With no more spare tyre, we all had to ride in the patrol car, and the guys left Mak, Daniel and I at the toll plaza (Ayer Keroh) and brought Abah to buy new tyres. Then, they send Abah back to the incident's place, changed the tyre, and Abah came to pick up us at the toll plaza. The rest of the journey was smooth, and Abah dropped me at Bangi so that I could continue with my work, and they went home. I stayed back at the office until about 9pm to complete the task. Reached home, packed our stuffs, for we need to go back to our 'Istana Hinggap.' Sampai sana dah pukul 1am pun. Adus letih sungguh! There you go, my adventure and action-packed real-life drama, that I, myself couldn't believe that I went through them. Agak-agaknya berapa ribu km la yang I travel throughout the 2 weeks ya? Today is the 5th time that we are unable to celebrate Abang's birthday, after he was suddenly taken from us on April 11, 2001. It was such a painful and surprised loss for all of us, and it took forever for us to heal from the deep wound that marked our hearts the day he left us. Tears are welling from my eyes as I am writing this. Never had I able to talk about Abang without crying, or at least with eyes brimmed with tears. I couldn't imagine how Abah and Mak feel- they had never hide how sad they were everytime they talk about him and pray for him. I was very close with him, as it was 4 years together for both of us until we had my sister. Even after that, we remained close, and when my youngest brother arrived, my sister clicked with him. So, Abang and me remained close. My brother was the one person who didn't speak much. He liked to keep things to himself, but he always tell me if he was having problems or anything. He was also the most religious one in the family. I remember there was one night when he called me at the house from his mobile, while he was driving home from work and feeling sleepy. He asked me to tell him stories to keep him awake. I was surprised that he called me instead of his fiancee at that time. And there was one time when Abah accidentally latched the additional lock at the front door, and Abang couldn't get in with his keys. At that time, handphone signal was really bad at my housing area, so he had to drive on top of a hill just to get a clearer reception and called back home for me to open up the door. He was quite angry, frustrated and merajuk at that time, saying that we purposely didn't want to let him in. Abang helped me a lot, especially computer-related as he studied IT and worked as an IT Analyst. He bought me my first desktop PC, and he helped me a lot with my final year project in University. There are so many memories with Abang that I carefully kept inside my heart. It was that fateful April 11, 2001 that we lost our beloved family member, unexpectedly, as we were talking, joking and eating together just a few hours before that. My brother actually checked himself in at Tawakal Hospital (his company's panel hospital at that time) after his blood test result confirmed of dengue virus detection. He was not unconscious or anything, as a matter-of-fact, he looked healthy at that time. It was Monday afternoon that he checked himself in there. He called quite late from the hospital saying that everything was ok. We visited him on Tuesday afternoon at about 5pm. He looked ok, but complained of sore throat, thus couldn't eat much. When the hospital meal came, I ate together with him because he said he couldn't finish the meal. We left the hospital at about Maghrib time as we wanted to send my sister back to her hostel in UiTM, Melaka. We stopped at Seremban Rest Area for dinner and at that time, my youngest brother and I were already week from high fever (yes, both of us were also infected by the virus, but unknown at that time). Mak thought of dropping by to visit Abang again after we sent Izza, but seeing that Azfar and myself were too week from fever, Mak and Abah changed their plan to visit Abang the next day instead. At about 5am the next morning, we received an emergency call from the hospital. The Doctor said that Abang was in a critical condition and have difficulty breathing. He called for consent to insert tubes inside Abang's body to help him with his condition. We then rushed to the hospital and reached there at about 6.30am. Abang was already in ICU when we reached there, and the Doctor said his condition had worsened; not only he had difficulty breathing, but blood had already streamed out from his nose and mouth! We seriously couldn't understand how come the condition became so serious, and we were only informed about it a tad too late. Was it an act of negligence? Takkan he became like that within 1 or 2 minutes kan? Whatever it is, the hospital should take full responsibility for their inabilities to control such situation, until it caused a precious life to be ended, and a family lost their loved one. Of course it was fated by Allah, but at least we could have been informed earlier, when his health condition started deteriorating, so at least we were not cheated of the chance of being together with him during his last moments on earth! Anyway, we were let in to see him at about 7am. I still remember clearly that there were 2 nurses at each side of Abang's bed in the ICU ward, one pumping oxygen in his mouth, while the other wiping blood from his mouth. The Doctor informed Abah that Abang's heart had stopped beating, but they were continuing pumping oxygen into his lungs until Abah gave consent to stop the process and they can pronounce him dead. What choice did Abah has? He consented, the nurse stopped what she was doing, and we lost our dear family member. I remember staring blankly at Abang's body, my head spinning in denial. As if I was in a typical Malay drama in a scene where somebody passed away, and the people left behind seemed in shocked and disbelief. It was just a few hours ago that we shared laughter and food! And at that time, he had already lain lifeless! I remember crying non-stop afterwards, right until the time his body was finally buried. He was smiling, as if in a very contented sleep, that was what everybody was saying. I laid on top of his grave, crying very painful tears, and I could still feel the pain up until today. Five years had passed without him with us, but it was never a day passed without us remembering him. His birthday, passed-away day, Hari Raya, all bring back sad memories for us, and we now had to celebrate them in different ways than usual. As you might expect, your baby is the kind of baby every first-time pregnant woman imagines herself to have: good as gold. Your baby is mellow, eternally smiling and consistently undemanding. Her cues are easy to read. She's not bothered by new surroundings, and she is extremely portable. She feeds, plays and sleeps easily and usually doesn't cry when she wakes up. An angel baby can often calm herself down, but if she gets a little overtired, perhaps because her cues were misread, all you have to do is snuggle her and tell her, "I can see that you're overtired." Then turn on a lullaby, make the room nice and dim and quiet, and she will put herself to sleep. Quite right, Alhamdulillah....Mummy loves you SOOOOOO much!!!! Mmmmmuahhhhhh!!!! 1)Everything went perfectly smooth in the beginning. Guests began arriving as early as 11 am. 2) My Chinese family arrived at around noon. Daniel jumpa the other side of the family for the first time. 3) Time ni langit dah jadi TERSANGAT mendung. 4) By Zuhur, rain had started- a HEAVY one that was....Tunggu punya tunggu, hujan tak juga teduh. Meanwhile guests were still coming, and stucked dalam khemah sebab tak dapat nak balik. 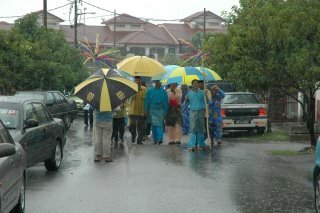 Payung-payung terpaksa digunakan untuk menghantar sanak saudara ke dalam rumah and also the other guests to their cars. 6) By the time makan beradab, hujan pun berhenti. Guests start ramai semula till about 5pm. Lama dah tak update pasal budak kecik manja Mummy sorang ni. Daniel sekarang dah 6 bulan setengah (how time flies?). Becoming more active as days went by. 3) Babbles non-stop. Even worse when about to fall asleep. All sounds would come out until he finally dozes off. 4) Loves eating and loves to watch other people eat. 5) Takes up 1/2 of the bed while sleeping at night. Ayah and Mummy kena sempit-sempit at the other half of the bed (bagus gak...hehe..). Would sleep horizontally at night and wake up vertically the next morning. 6) Doesn't cry when waking up. Will amuse himself until others realize that he actually had waken up. And will smile nicely at that person. 7) Couldn't stand it if lambat dapat minum susu. Will cry macam kena pukul teruk-teruk. Must be there and then- no compromise! 8) Loves to golek-golek on the mattress. And when he got tired, kaki and tangan akan keras, pointing upwards, signalling that he wants somebody to pick him up. 10) Refused to sleep walaupun mata dah kuyu and merah, when everybody is around (Ayah, Mummy, Atuk, Nenek, Acik and Pokcu) during weekends. Have to force him to sleep and he will babble loudly and meniarap dalam buaian sampai terlelap.. The signboard that stated we have to pay RM10 if we don't show a proof that we are Giant's customer has been replaced by a BIG photo. The caption read "Our prices are so cheap even our competitor is shopping with us!" or something like that. The photo showed Mydin workers from behind (their uniforms ada tulisan MYDIN besar kat belakang)were waiting for their turn to buy NASI BUNGKUS from one of Giant's medan selera's hawkers! Deyy!! Makan tak consider as shopping ok? Adui laaa!! Kalau nak buat cheap camera trick pun berpada-pada lah sikit!!! My first impression: SIAPALAH YANG CAME OUT WITH THIS STUPID IDEA EH? 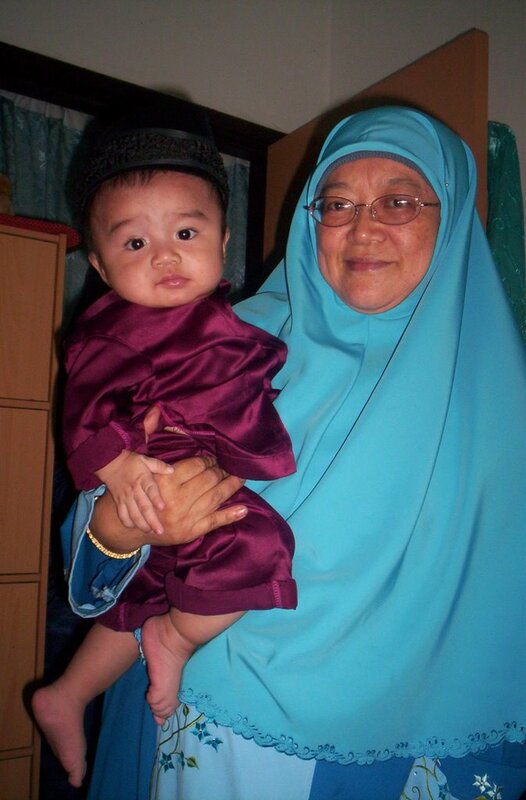 The next day, I started my journey South pulak...Meeting a client and then picked up my Grandma for my sis' wedding. Daytrip je. Reached home at about 9pm. Zombie habis! Nasib baik Thursday was Merdeka holiday. Dapat la relax sikit..Tapi, tak rest sangat pun as relatives ramai dah sampai to help with the wedding preparation. Petang tu siap bawak my Mum pergi shopping lagi as some of the stuffs for 'hantaran' masih belum complete. Brought Daniel along. Bought him a songkok. He looked really cute with it..hehe... Tu pasal la ramai orang yang nak dukung dia kat shopping mall tu... Tak pasal-pasal ramai yang offer jadi babysitter while Mum and me took turns to search for stuffs. Friday was the akad nikah day. Was quite chaotic as we rushed to complete the necessary stuffs and berkemas. Scheduled at 10.30am and the Pak Imam aka Penolong Pendaftar Nikah came on time with his witnesses. I hadn't even took my bath when they arrived! Punya lah kelam kabut..Dengan nak settlekan Daniel lagi. When I finally descended from my room, rombongan pihak lelaki dah masuk rumah and the ceremony has begun...Malu sehh!! Was quite smooth and fast. Abah yang nikahkan Ija, just like he did with me last year. Sekali lafaz je, sahlah Ija-Ajib jadi Hubby and Wife. Tapi Pak Imam tanya banyak juga soalan. Nasib baik lah Ajib dapat jawab semua and tak panik. After that, everybody went for lunch and proceeded with Solat Jumaat. And we continued with the final arrangements. Saturday was the big day! Memang sibuk and hectic like nobody's business! 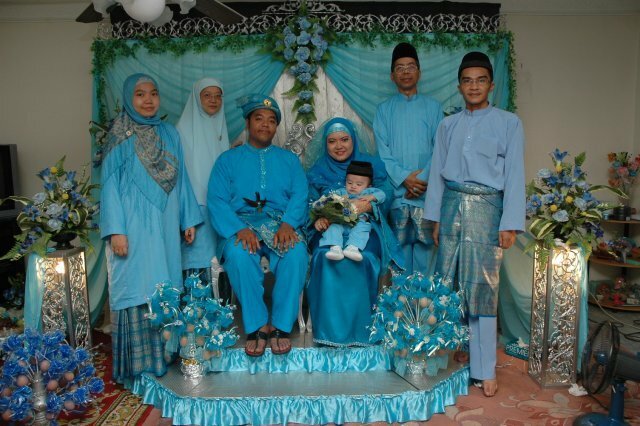 All family members wore blue as the theme colour of this wedding. Semua nampak biru! 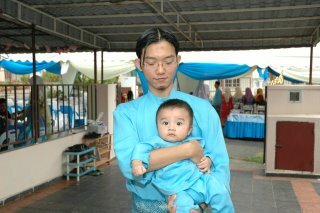 Even Daniel got his blue baju Melayu, made by his Nenek (my Mum). The day memang filled with drama, I tell you! But that would have to wait for Part Two of this update..hehe...Dah ngantuk la....Tata! !